R&D Hubs represent centres of activity, research, and experimentation by Level 2 and Level 3 member schools. 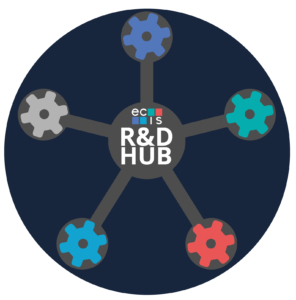 By facilitating R&D at multiple school hubs globally, ECIS strengthens member networking and expands external partnerships, whether with universities or companies serving the education sector. These centres of excellence represent key learning opportunities for companies regarding their products and services, and allow our member schools to tap into a concentration of research and teaching talent from universities. With multiple R&D sites around the world, our network fosters collaboration, curiosity and innovation. Read below how our R&D hubs serve companies and universities. ECIS is curating innovative partnerships between schools and companies to ensure that our member schools are at the forefront of teaching and learning. In such a partnership, schools and companies learn how products and services are able to creative positive impact in teaching and learning. Each partner gains deep insights, and international education wins! As the curator of this innovative partnership, ECIS shares the (anonymised) findings with our community of members, helping them understand where value is to be found for their school. Our schools want to be positioned in the market as innovative, creative, and impactful. That kind of positioning comes from engaging in research and development around products and services that promise impact in teaching and learning. You can’t get this kind of engagement from an exhibition stand; you need time and multiple interactions in a school itself. This is experiential, hands-on learning that benefits both the school and the company. Ultimately, it’s about relevance of your product or service. You want to gain deep insight into how your offering works – ideally, in diverse school settings that take into account different curricula, pedagogical methods, cultures, and languages. How relevant is your product or service to a school? Do you desire deeper user feedback in order to inform product development or product management? Can you take your product or service into a new market? Place it in an R&D Hub for at least one term, and find out! ECIS is curating research partnerships between member schools and our higher education members, leading to benefits for all our schools when it comes to what is working (and what is developing) teaching, learning, and leading. Not only do we connect universities with member schools in order to conduct university research projects, we also identify our school’s research desires to universities, in order to secure university research assistance in undertaking school-identified research needs. Each partner gains deep insights, and international education wins through the publication and/or sharing of the research findings. Being a Level 2 or Level 3 member school sends a message that a school desires to place itself at the forefront of research and development, and benefits a member school by positioning it as innovative and impactful, in terms of its academic programme. That kind of positioning translates into an enhanced value proposition for parents and all community stakeholders. Ultimately, it’s about relevance of the school, as well as the university. Is the school relentless about positioning itself at the forefront of teaching and learning, and is the university just as relentless about remaining relevant in terms of the impact of its research? Our member schools’ settings, curricula, pedagogical methods, cultures, and languages mean that a research project will be rich and diverse. The findings from these projects stand to advance education as a whole, and that is an intentional aim of our research and development hubs.